From speedy race cars to trucks and farm tractors, from Woodies to lovingly restored classics, you can see it all at the Celebrate Commemorate car show. Stroll down Main Street on Sunday, May 28, listen to music by popular disc jockey Jim Schreck of WNYR-FM radio and Bob Gilbert of Dynamic Sound, and talk to owners of the hundreds of motorized vehicles featured at Wheels on Main Street. The car show is organized by Bob and Bev Good and Gary and Donna Stengle and begins at 11 a.m. Registration may be made between 9 and 10 a.m. the day of the show at the booth in front of the police department on West Main Street. Registrants will receive a commemorative dash plaque. Registration is free. 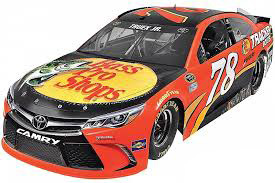 As a special feature this year, come see the Number 78 NASCAR Sprint Cup Car, driven by Martin Truex . 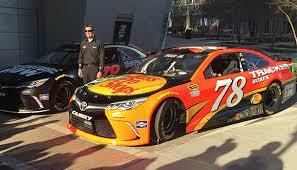 The car will be parked in front of Parrow’s Garage next to the Village Office. Visit the Watkins Glen staff to get more information about this summer’s events. The Waterloo Lions Club and the Woodie Northeastern Chapter will host the annual Woodie Reunion, a gathering of the wooden-bodied cars manufactured in Waterloo from 1939 to 1957. Chair Gary Valerio said Woodies will participate in the Freedom Parade on Saturday at 11 a.m. will be on display in front of the Main Street Shoppe Center.